Fully furnished Suites and Apartments, just around the corner from the hotel or in the heart of Vienna. The apartments are available in various sizes and price categories, for business or private use, as short or long-term accommodation. he Carlton Opera Hotel Vienna is an elegant Art Nouveau hotel, only a few minutes from Vienna's busy center, yet calmly situated in a quiet one-way street. Vienna's elegant shopping promenades, Kärntnerstraße and Mariahilferstraße streets, are in convenient reach from the hotel. The Carlton Opera Hotel is situated between the famous Naschmarkt market (fruit, vegetables and delicatessen, on Saturdays also a flea market) and Karlsplatz square in the legendary "Freihaus" quarter. The Freihaus (literally "free house") for about 300 years had been Vienna's largest housing complex, a small town in itself, and called so, because with tax exemptions and its own jurisdiction it possessed a certain independence. Ever since the Freihaus and the Vienna-Wieden district have attracted artists of all kinds. Composers and musicians, writers, sculptors and painters have had their studios and residences here. It was here that Wolfgang Amadeus Mozart conducted the Magic Flute, when it premiered in the Freihaus theatre. It is the Magic Flute's librettist Emanuel Schikaneder - who would later founded the nearby "Theater an der Wien" - the street, our hotel located in, is named after. Furthermore, no less famous names like Antonio Vivaldi, Christoph Willibald Gluck, Franz Schubert, Johannes Brahms, Johann Strauss son, und Hugo Wolf lived and composed in the Wieden discrict. Other famous names connected with Vienna-Wieden are Moritz von Schwind, Hans Makart, Karl Kraus, Ludwig Wittgenstein, and many more. The Freihaus is no more, its remnants were removed in the 1960s. What remains is an alternative spirit: modern galeries, independent cinemas (Schikanederkino, Filmcasino), a thriving musical and theater scene, and - due to the proximity of Vienna's Technical University - a lively student, nightlife and pub scene distinguish the hotel's immediate neighborhood. Many artists choose to lodge in our hotel because of our close proximity to cultural sites (Museumsquartier, Secession). We closely cooperate with the Vienna Festwochen and many other cultural institutions. Regarding our techical facilities, we offer free computer and internet access in the lobby, for notebooks a WLAN HotSpot run by T-Mobile as well as free Wireless LAN throughout the hotel. 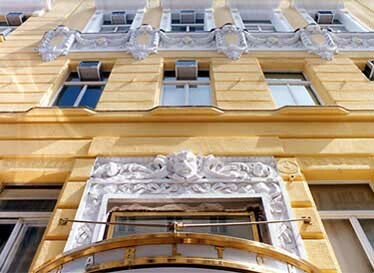 We are one of the few hotels of our category in Vienna in which every room is air-conditioned. All rooms are equipped with a small safe, telephone, a kettle with free coffee and tea, and of course TV. Parking lots and a parking garage close to the hotel are available. We cooperate with the renowned fitness center John Harris to offer greatly reduced day passes at their modern studio at nearby Margarethenplatz for € 17. To passionate joggers we would e.g. recommend the beautiful park of the baroque Belvedere palace not far from the hotel. Please also consider a stay at our hotel in Budapest, and our apartment Suites in Vienna. A new addition to our family of hotel­s is the 4-star Hotel Mailberger Hof right in Vienna's pedestrian zone.